A clean-out is important for all systems. Installing a clean-out at the wall outside the home or business is a good idea if the system ever needs to be jetted or cleaned. The clean-out allows all this work to be done outdoors, so any mess stays outside. Inside the home, there is potential for the clean-out to be hidden and the possibility of a major spill. They can either be one direction to clean the pipe either forward or backward, or two directional to clean in both directions. Clean-outs should be accessible at the surface and located in a protective enclosure such as a valve box when necessary. There should be at least two clean-outs in the building drain: one at or near the base of the stack and one near the connection between the building drain and the building sewer. The clean-out at the outside wall may be inside or outside the building, should be made with a full “Y” branch fitting and should extend at least 2 inches above grade or finished floor, except when a flush cover is needed in traffic areas. The clean-outs should be of the same nominal size as the pipes they serve: up to 4 inches in diameter and not less than 4 inches for larger piping. It is advised, and required in some codes, that the distance between clean-outs in horizontal piping should not exceed 100 feet in straight runs. 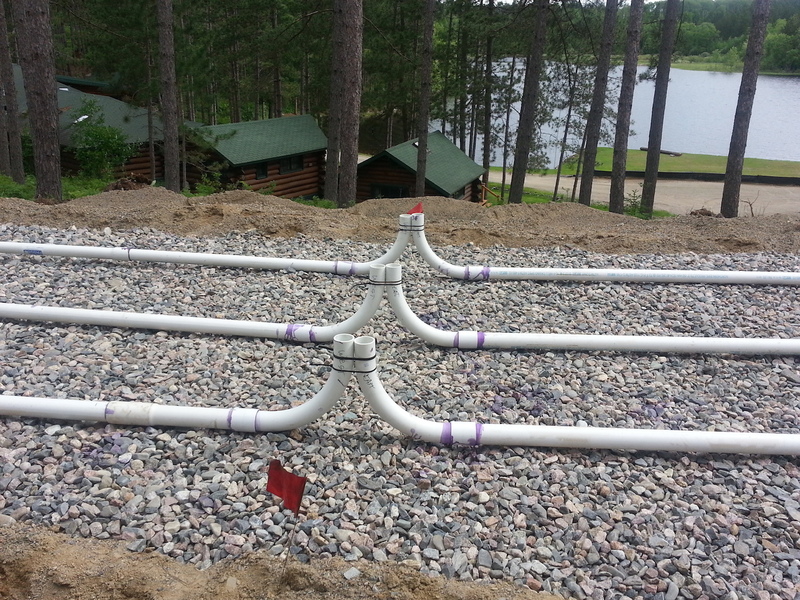 The riser pipe on the clean-out should be made to standard pipe sizes, conform in thickness to that required for pipes and fittings of the same material, and extend not less than 1/4 inch above the hub. In a home, each clean-out, unless installed under an approved cover plate or left flush with the finished floor, should be at least 2 inches above grade, readily accessible and should not be covered with cement, plaster or other permanent finish material. Have threaded removable caps or plugs on the ends of the laterals to allow for cleaning the laterals and for monitoring the lateral pressure. Be large enough to allow access to caps or plugs with hands, tools, etc. Be accessible from the ground surface. Clean-outs are placed at the distal end of pressurized laterals to allow flushing of the system prior to startup, measurement of operating pressure and regular flushing of solids. 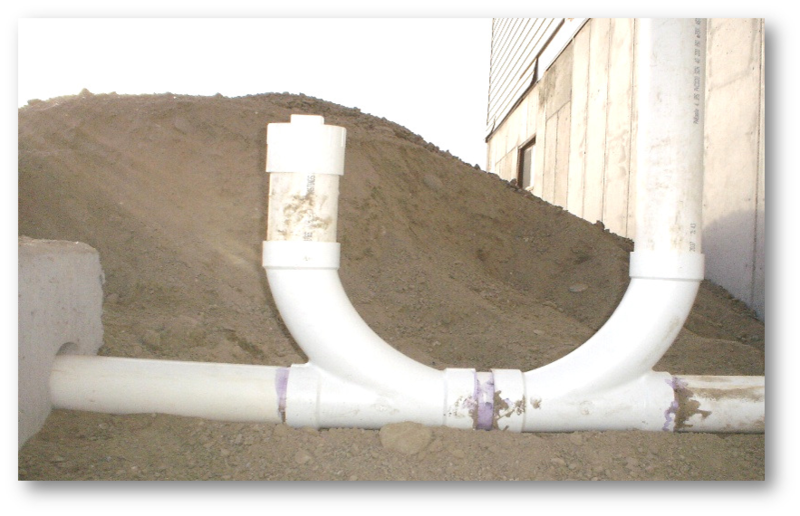 The pipe configuration of the clean-out varies, but the most basic and convenient clean-out consists of a 90-degree turn up. Two 45-degree elbows or one sweep 90-degree elbow may be used. Using these allows the service provider to use a pressure washer or bottlebrush for cleaning purposes because the gentle turn allows easy insertion of the pressure line. If a cap assembly is used, a female screw cap is easier to remove during operations and maintenance activities. Alternately, ball valves may be installed at the distal end of the lateral in a vertical position. These can be opened to flush laterals using pump pressure. There does need to be a perforation partway up the elbow to make sure that air is able to re-enter the pipe after the pump shuts off. The clean-out is then brought to grade and covered with a landscaping box. 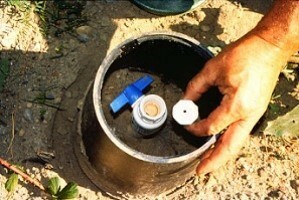 It is recommended that rock be placed in the box to cover the perforation so effluent isn’t spraying freely in the box. It is recommended that larger-sized boxes be used; with the small ones, it is difficult to get your hand inside to remove the threaded cap. Insulation is also recommended on the lid of this box in cold climates. Some installers also place removable insulation around the clean-out. Make sure that the access is completely stabilized to prevent shifting during backfill activities and after installation. Its location and orientation should be verified during installation to ensure the clean-outs are ultimately located in the center of the access upon completion of the installation.